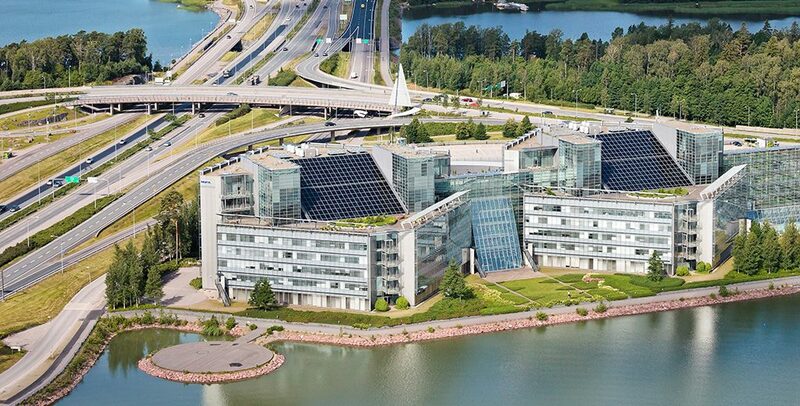 Exilion Real Estate I Ky, managed by Exilion Management Oy, has today sold the property known as the former HQ of Nokia Corporation, comprising of two office buildings and a parking house in Keilaniemi, Espoo, Finland. The shares of the mutual real estate company were sold for approximately EUR 164 million to a fund managed by Deutsche Asset Management. The purchase price corresponds to a net initial yield of approximately 4.65 percent. Object of the transaction, MREC Kiinteistö Oy Espoon Keilalahden ABCD-talot, owns the property located in the address Keilalahdentie 2–4, Keilaniemi, Espoo, comprising of two office buildings and a parking house built in 1996 and 1997. The office buildings have a lettable area of approximately 31,000 sqm and the parking house has approximately 1,250 parking spaces, of which 404 are in use of the neighbouring building. The property now sold is a part of the entity Exilion acquired from Nokia Corporation in 2012. One of the office buildings in the entity has already been sold by Exilion in 2014 in a transaction with a fund managed by AXA Real Estate. “Executing the transaction is a natural part of reshaping our current real estate portfolio. The total investment in the entity of the properties has been excellent, and furthermore, we are genuinely pleased to find such a reliable and established new owner for the property, who will continue to develop the property in cooperation with the property users”, says Mr. Ari Talja, the managing director of Exilion companies. Catella Property Oy and Aleksandra Attorneys Ltd acted as advisors to Exilion in relation to the transaction.